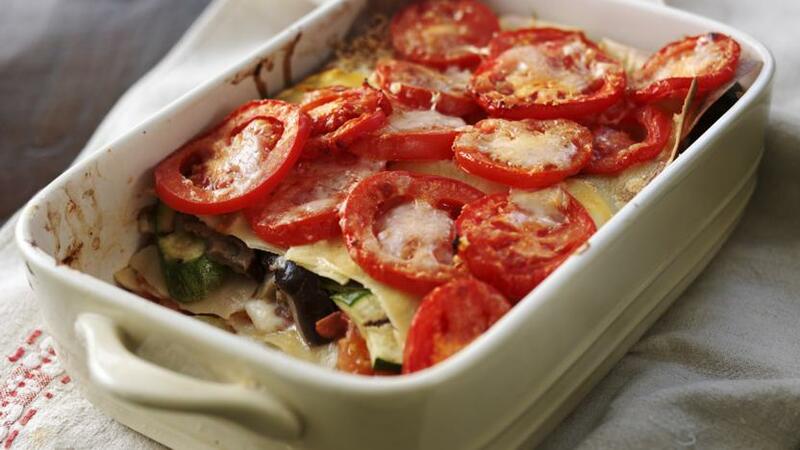 This hearty vegetable lasagne will be loved by vegetarians and meat-eaters alike. Serve with a green salad and crusty bread. Slice the courgettes and aubergine into diagonal slices. Heat a ridged grill pan, brush the slices with olive oil and grill for several minutes each side until chargrilled, then remove. You'll have to do this in batches. Preheat the oven to 190C/17C Fan/Gas 5. Brush the inside of a large baking dish with a little oil. Place a layer of sliced tomatoes (about one third of the total) on the bottom, slightly overlapping. Next, layer with half of the courgette and aubergine slices. Sprinkle with half the chopped garlic and one tbsp balsamic vinegar. Scatter over half of the torn basil leaves and season with salt and pepper. Layer half the mozzarella slices on top, then cover with half the lasagne sheets. Continue layering with the rest of the ingredients, ending with a layer of tomatoes on top. Sprinkle over the parmesan. Cover with foil and bake for 35-40 minutes. Remove the foil and bake another five minutes until the parmesan's golden on top.